We were very sorry to learn of the passing of Christopher Colclough on 28 June 2017. Chris was a close friend and colleague to many at Mokoro, having begun his career in the Ministry of Finance and Development in Botswana, where the founders of Mokoro also first met, and since then providing advisory inputs and support to various Mokoro assignments including the Global evaluation of UNICEF’s upstream engagement in education and the Mid-term Evaluation of the Education for All (EFA) Fast-Track Initiative (FTI). Many thanks to Steve McCarthy for these memories of Chris. I don’t remember which of us first had the idea, in 1976, to write a book together on the economy of Botswana, but both Chris (as we always called him) and I felt that there was an important and interesting story to tell the world. And between us there was a good fit of what we knew of the country, its history and development. But I was no academic (and never would be), not even a qualified economist, so I was rather flattered that such an eminent adviser to the Botswana government, writing a definitive Manpower Plan, would even think that we should work together. But Chris patiently introduced me to the ways of academia and acted, in effect, as my supervisor. (More recently, seeing various appreciations of him written by others, I have been struck at how often his patient, considerate and helpful way of supervising PhD theses has been referred to.) Later, when Carol and I returned to England in August 1977 with no new job prospect in sight, he kindly arranged for me a six-month Visitorship at IDS to continue with the project. Chris must have left Botswana at more or less the same time as us. Mike Hubbard writes that when, some years later, he asked Chris why he had left at that particular time, his response was that ‘He was getting too powerful’ – a remarkable testament to his modesty and humility in the best sense of that word. 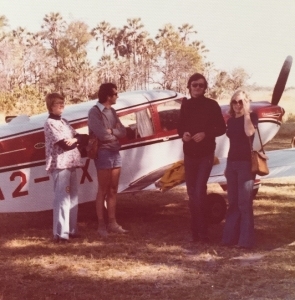 Before we left Botswana, Carol, Chris, Christine Smith (Allison) and I had a wonderful trip to the Okavango and Savuti, a trip which I think pressure of work had prevented any of us taking before. Roland Maerhle kindly lent us his Toyota Landcruiser for the purpose. The trip evokes many strong memories – baboons at Savuti scattering our possessions, including Chris’ passport around our camp in the night, while in the Okavango it was hippopotami blundering around our flimsy cabins in the small hours that kept us awake. Christine still has a photo of us all before we flew off to the Okavango camp. 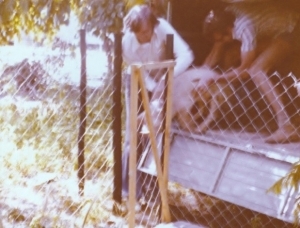 When I searched myself I didn’t find any similar photos, but was rather surprised to find one (very faded) picture of Chris helping us unload piglets from the back of our truck – perhaps a rather unexpected side to his character. Sadly they were all killed by a pack of marauding Gaborone dogs three nights afterwards. Others will know more about his academic achievements as he moved from IDS, where he was deputy Director for a while, and then to a Professorship in Cambridge. (See his Guardian obituary). His academic colleagues repeatedly mention his intellectual rigour, diplomatic skills and continued good temper even in difficult situations, and the warmth and support he gave to those whose work he directed. His editorship of the IDS book States or Markets was a highlight. More importantly, he became an internationally known expert in education, and in particular was a tenacious advocate of the huge importance of primary education. In another context this would be described as a ‘preferential option for the poor’, which I do think was a mark of Chris’ life and work. True, I did not read much of his academic work, my interests lay elsewhere, but I do still have a signed copy of his highly influential book: Educating All the Children: Strategies for Primary Schooling in the South published in 1993. What I learned from this, which I have always remembered, is that Universal Primary Education imposes such a small cost on government budgets that all countries can afford it – if only they have the political will to do so. As to the practical importance of UPE, my example comes not so much from Chris himself but from Quett Masire’s pithy comment that it made it possible for farmers to distinguish between a bag of fertiliser and a bag of weed killer. In the period when Carol and I had most to do with Chris we always felt there was a shadow of loneliness over his personal life. So it was wonderful when he and Sarah met, married in 1992 and then had Giles. They shared many common interests, not least in the arts and especially music and opera at Glyndebourne – it is said he could have had a career as a pianist. And when we eventually visited Little Hallands we were overwhelmed by the beauty of the garden and the house (with its two grand pianos!) – which reminded us so much of Monet’s house at Giverny, though without the water lilies. It is so sad to see Chris taken at such a comparatively young age, when there could have been so much of life for him and Sarah to continue to enjoy together. Our heart goes out to her as she now faces a future without her beloved husband and companion. Eminence could be ascertained by the programme one belonged to. I was a mere ex ODIn, now on ODA terms, whereas, if I remember well, Chris was SCAAP (Special Commonwealth Africa Assistance Programme). Ford Fellows, were higher up the scale – though not necessarily more highly regarded since they just ‘advised’ rather than, in many cases, doing any useful work.